Group therapy is an interactive way to speak with peers and therapists about what is going on in your life. Commonly, group therapy is when approximately five to ten individuals meet face-to-face with one or more trained group therapists to discuss and process current concerns and/or challenges. Examples might include stress, self-esteem, self-confidence, anxiety, depression, relationships, family, and coping skills. Frequently, group members provide feedback to one another by expressing their own feelings about what someone says and/or does. This interaction provides group members with an opportunity to learn more about the way they interact with others, as well as gain a sense of self-confidence. What makes the situation unique is that it’s a safe, supportive, and non-judgmental environment. The content of group therapy sessions is confidential; what group members talk about and/or share with one another is not discussed outside of the group. Given the significance of this topic, confidentiality is frequently discussed amongst group members throughout the course of the group. When is Group Therapy taking place? 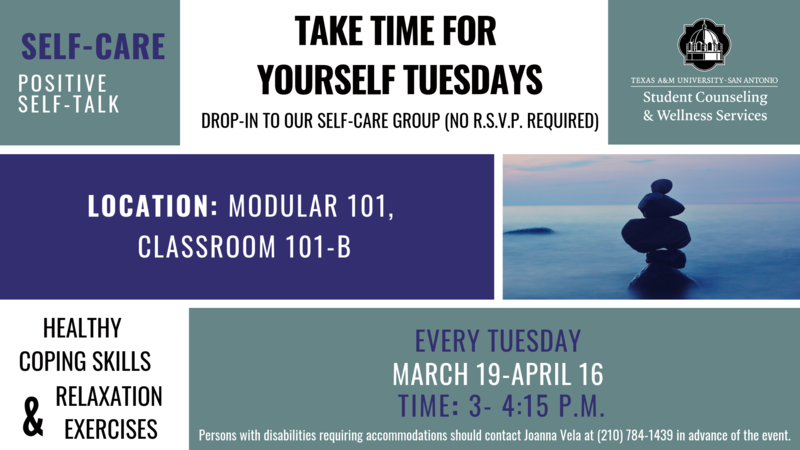 Starting Tuesday, March 19 at 3 p.m., SC&WS will begin our five week drop-in group focused on self-care. This six week drop-in group will occur on the same day and time each week; no reservation required. If you have any follow-up questions, please call (210) 784-1331 or email stucounseling@tamusa.edu. All currently enrolled A&M-SA students are welcome to attend! Day & Time: Tuesdays at 3 p.m. Yes! In fact, research indicates group therapy is an effective treatment modality to help individuals improve their symptomology, as well as develop effective communication and interpersonal skills. Under the skilled direction of a group therapist, the group is able to provide support to one another, offer alternative ways of approaching situations, and gently confront each another. In this way, challenges become resolved, alternative behaviors are learned, and individuals develop new social skills or ways of relating to others. During group therapy, individuals begin to see that they are not alone and others share similar struggles. A supportive group can help individuals feel connected to others who might share similar goals. Explore issues in a social setting which more accurately reflects real life. Interact with peers who present with a shared purpose of what they hope to accomplish from group therapy. Observe and reflect on one’s social skills, as well as other’s social skills. Benefit both through active participation and observation of others. Provide and receive immediate feedback about concerns, issues, and problems affecting one's life. Work through personal concerns in a supportive, confidential atmosphere and at the same time, assist others in working through their concerns. In other words, many individuals report they don’t feel alone given the amount of support and encouragement received from others in the group. How do I know if Group Therapy is the right fit for me? It is normal for students to have fears or anxieties about “fitting in” to a therapy group. We are here to help! We encourage students to contact the Office of Student Counseling and Wellness Services at (210) 784-1331 should they have any questions or concerns about their appropriateness for group therapy. Group therapy offers an opportunity to work through an array of different concerns. Many times, unexpressed feelings are a major reason why individuals experience difficulties and group therapy can help individuals learn effective ways to express thoughts and feelings. Self-disclosure is an influential part of group therapy and can impact how much is taken from the group. How much individuals share about themselves depends upon what they are most comfortable with. If you have any questions about what may or may not be helpful to share, then you are encouraged to ask the group, the group facilitator, or a licensed mental health professional at the Office of Student Counseling and Wellness Services. Please contact our office at (210) 784-1331 with any questions. We look forward to speaking with you!